Loafing Around is a book about bread. There are lots of books about bread, some of which are excellent in their way, and many written by well known professional bakers. One might quite reasonably ask why write yet another book on the subject? 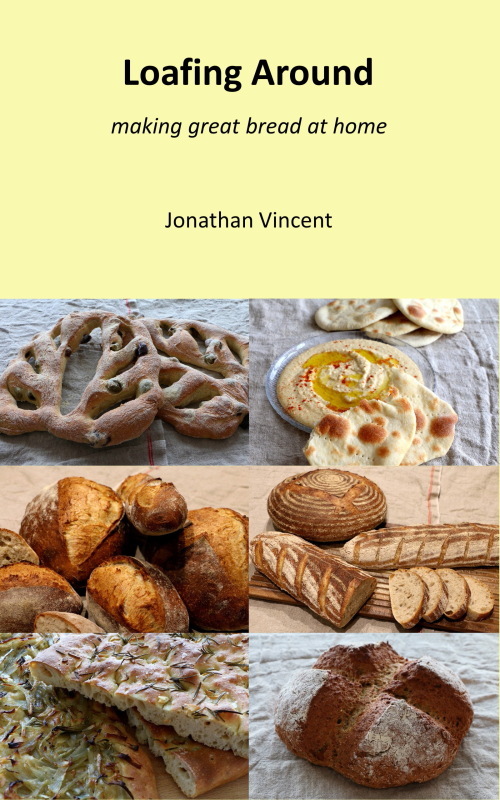 This book began as a collection of recipe notes that I developed when I decided not to buy any more bread from supermarkets or high street bakeries. As a keen cook I had baked bread for many years, but on a casual basis. However, I became increasingly disappointed with the offerings from the supermarkets and high street bakeries, especially when returning from holidays where the local breads were so much more tasty than those I could buy here. Without an artisan baker locally, I decided to explore the craft in more detail and develop the knowledge and skills needed to bake at home the sorts of breads I craved: breads made without many of the arguably unnecessary ingredients included so often in commercial bread, breads allowed the time for a proper fermentation, and breads baked properly to develop a flavourful crust and wonderful crumb. As I worked on recipes to replace those loaves that we would regularly buy from the supermarket, as well as replicate some of the sorts that we have enjoyed on trips abroad, the book more or less formed itself. As well as a collection of tested recipes, I have tried to recount, as best I can, the important points of the bread making craft that I had to learn in order to prepare great bread at home. As a book written by a home baker, the recipes and techniques should be within the capabilities of any keen cook – if I can do it, without special training, equipment, or ingredients, there is no reason why these breads cannot be replicated elsewhere. The Loafing Around bread book should be available from various bookshops and online retailers, in print form and as an ebook. Click here to view the book on Amazon’s website: print version or kindle version. Loafing Around—making great bread at home. Written for the home baker by a home baker, Loafing Around aims to not only provide a diverse selection of tested recipes, but also describe the processes and techniques involved in enough detail to allow the home baker to develop new recipes with confidence. Loafing Around covers the main types of bread: unleavened bread, soda bread, breads made using baker’s yeast, and sourdough. Recipes use a range of flours, including white and wholemeal wheat, rye, and spelt, and show how to incorporate other ingredients such as seeds, nuts, and fruit. A diverse range of styles is included from classic French and Italian types to Indian roti and naan and South American corn tortillas. Dozens of illustrations expose the processes and techniques involved in making these great breads at home.